Whether you suffer from hearing difficulties or simply find it difficult to wake up in the morning, the Geemarc Wake 'n' Shake Extra-Loud Curved Alarm Clock with Vibrating Shaker combines an extra-loud alarm and vibrating pad to help alert you in the morning. With a bright screen and stylish curved design, it is both attractive and easy to use. One of the main benefits of the Geemarc Wake 'n' Shake Extra-Loud Curved Alarm Clock is the ability to adjust the volume of the alarm up to 90dB. This will help ensure that the aural alert can be heard clearly, whether used as a wake-up call or as an indicator when programmed to sound at a specific time of day. The alarm has the ability to continuously sound for up to an hour unless manually stopped, which is particularly useful for heavy sleepers who may need a little time to wake up once the alarm sounds. The Shaker Pad can be placed beneath the pillow or somewhere else near your person where you will be able to easily feel the vibration. When the scheduled time sets off the Shaker Pad, it vibrates to provide a physical prompt, making this ideal for anybody with hearing difficulties who would struggle to hear even the loudest alarms. As the Shaker Pad can be used either alongside or instead of an audible alarm, it also makes it ideal for use when it is necessary to wake up earlier than others in the home, thus avoiding disturbing anybody else with the loud noise. With a large, bright LED display, the red numbers on the screen can be easily read at just a glance. 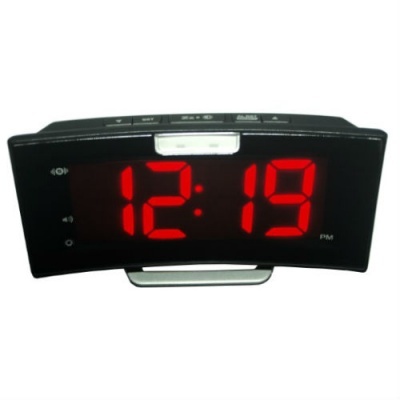 The digital clock can be displayed in either twelve- or twenty-four-hour clock, making it ideal for any user. The clock also features dimmer control, so if the screen is too bright it can be adjusted for a kinder display screen that will be easier for you to read. A USB port is situated at the rear of the alarm clock. 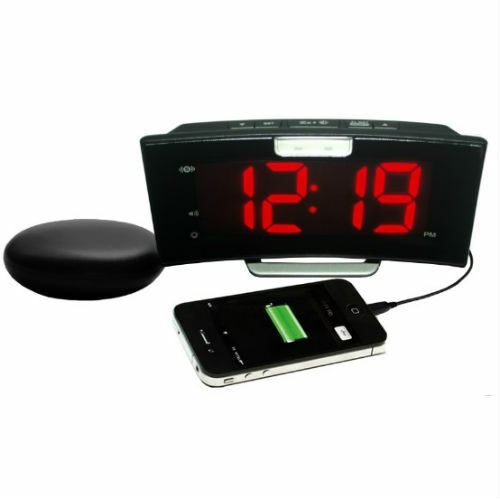 This makes the clock particularly useful for use when travelling, as it will enable you to charge devices such as smartphones without having to worry about having enough power outlets for both the alarm clock and the phone. It also means you won't need to take an external plug adaptor for the phone, saving room in your luggage and reducing the stress of travelling to countries with different outlet systems. Please note that the mobile phone displayed in the image above is not included.